Checking, savings, CDs and money markets. Mortgage loans, auto loans, credit cards, personal loans and student loans. Insurance, investment, ID theft protection, mobile banking, online banking, bill pay, and overdraft protection. National banks, community banks, and credit unions. Navigating your way around banking can be time-consuming and confusing. 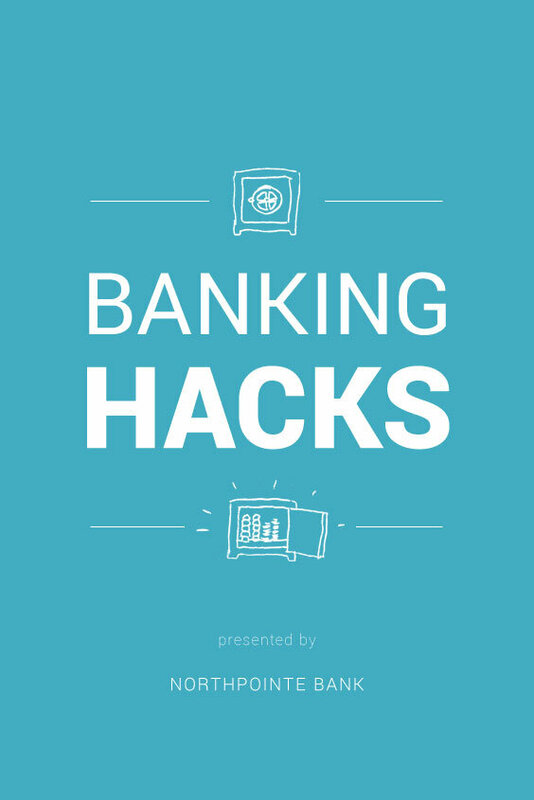 Fortunately, we’ve got an insider in the banking industry (Bill from Northpointe Bank) willing to shed light on how to hack your way to better rates, lower fees and other freebies! Did you know that Health Savings Account can be used similar to a standard IRA when the account holder turns 65 years old? At that point, there is no longer a 20% penalty for using HSA funds for non-medical expenses. If you find that you’ve maxed out the savings in your 401(k), IRA and Roth IRA, consider using your HSA as another retirement investment vehicle. Annual contribution limits for someone under age 55 is $3,250 for an individual plan holder and $6,450 for a family plan. For an individual able to carryover $2,000 annually each year over 30 years and assuming a very conservative 2% interest rate, their $60,000 in deposits adds up to more than $80,000 in their retirement portfolio! Roth IRAs provide a unique tax-advantaged savings option. Unlike Traditional IRAs or 401(k) plans, the money put into a Roth IRA has already been taxed. So there is no immediate tax credit or income reduction for contributing to a Roth IRA. However, the account grows tax-free as do all the interest earnings. Just as important, you can withdrawal your contributions at any time for any reason tax-free making this a great way to park money as an emergency fund. Another alternative is to consider using a Roth IRA money market account as a mortgage escrow account. This is especially true if you live in a state with high property taxes which does not require your mortgage company to pay you interest on the funds in your escrow (we’re talking balances of $5,000-$10,000+ in some states). Most Roth IRA money market accounts pay more interest than a normal savings account. Combined with the tax-free interest aspect, Roth IRA beats a basic savings account for an emergency fund or self-managed escrow account. Haggling can be awkward and also very rewarding. You expect negotiation to be part of the process when buying a new car but did you know the same applies with most banks. Banks want your business. But their published loan and deposit rates should not be viewed as static. Rather, it’s a starting point to figure out how much they really want your business! There are more than 10,000 financial institutions in the U.S. Leverage this fact to negotiate your way to high savings rates and lower loan rates. Most smaller banks have a rate match policy that will allow employees to increase deposit rates and lower loan rates to be on par or closer to other local competitors. So, bring in a newspaper or magazine ad or print out details from a competitors website. If your asking in-person this increases your odds of landing the discount since you’re present, ready to sign if they offer what you’re seeking. Now, this will not always work but you may be surprise to learn it will work approx. 50% of the time. Considering this effort could save you hundreds or thousands in the long-run, it’s definitely worth the conversation. Today, most financial institutions make very little money via the traditional banking model based on interest rate spreads – the difference in rates charged to customers on loans vs. what they pay to customers on deposits. As a result, many rely on fee income to fund their operations. But there is always wiggle room here. Certain fees cover cost but most are marked up to drive profit. Bottom line is this – if you ask, you can often get a fee waived or at least reduced. Overdraft fees? Yes – can be waived. Wire transfer fees? Reduced. Safe Deposit Box fees? Waived or reduced. Check order fees? Waived. You see where this is going. Now, if you ask for every fee to be waived expect to be met with resistance but if you strategically ask for 1-2 fees waived or reduced every 6-12 months and you’re a customer with multiple relationships with the bank than you can expect to be satisfied with the results. *Tax implications may apply to the strategies above. Consult your tax advisor to learn how these items may impact you. This post was brought to you by our friends at Northpointe Bank – founders of the 5% checking account. Bill Clancy is a Vice President of Deposit Banking at Northpointe Bank in Grand Rapids, Michigan. What to Do When You Feel Overwhelmed With Your Finances? I didn’t know that I could negotiate loan interest rates with banks – I thought it was just determined by credit history. Good to know! It’s easy to accept prices as they are – and never negotiate. It’s probably a culture norm too (not to). It’s seen as swarmy here.